Established in the year 1962, Lakewood Auto Body has been serving the Tumwater, WA area and has been catering to the different needs of auto body repair for the Porsche 911 efficiently. With experience and proven knowledge of almost fifty years, we dedicate ourselves to top-notch customer service. Our car repair specialists have made it their main aim to go above and beyond auto body repairs for every vehicle brought to our collision repair shop. Their skill and abilities are backed by sophisticated high-tech equipment and state-of-the-art resources. Top-quality auto body repair parts and other components, attention to each minor detail of the vehicle, tireless quest of expert craftsmanship and a strong commitment to customer satisfaction and support have made us a successful and leading collision repair shop and auto body shop for Tumwater residents. Cars and trucks are now days created more safety conscience than they were designed in the past. Lakewood Auto Body collision repair shop expertly and carefully renews the original design of your vehicle. The operation of your car or truck (how it drives, steers and operates) in addition to its outward appearance will be completely restored like it was previous to the accident. Correct welding is quite crucial to any auto body shop for work on the Porsche 911 Carrera Cabriolet. The components should be welded correctly to make sure the architectural strength of the automobile has not been compromised. Why do Tumwater Residents choose us as their auto body repair shop? Lakewood Auto Body continues to serve the residents of Tumwater, WA with expert auto body repairs. Our auto body shop uses technically advanced tools and equipment, and we are quite capable of insuring that your vehicle will run smoothly and safely on Tumwater roads. Tumwater residents can depend upon us to take care of all your collision repairs effectively. 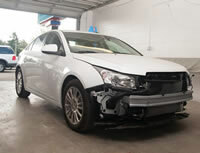 Trust the expert auto body repair shop for your vehicle's collision repair needs. Contact Lakewood Auto Body today! Call 253.581.0220.